The collaboration responsible for the record-setting refrigeration is called the Cryogenic Underground Observatory for Rare Events (CUORE), supported jointly by the Istituto Nazionale di Fisica Nucleare (INFN) in Italy, and the Department of Energy's Office of Science and National Science Foundation in the US. Lawrence Berkeley National Lab (Berkeley Lab) manages the CUORE project in the US. The CUORE collaboration is made of 157 scientists from the U.S., Italy, China, Spain, and France, and is based in the underground Italian facility called Laboratori Nazionali del Gran Sasso (LNGS) of the INFN. "We've been building this experiment for almost ten years," says Yury Kolomensky, senior faculty scientist in the Physics Division of Berkeley Lab, professor of physics at UC Berkeley, and U.S. spokesperson for the CUORE collaboration. "This is a tremendous feat of cryogenics. We've exceeded our goal of 10 milliKelvin. Nothing in the universe this large has ever been as cold." The chamber, technically called a cryostat, was designed and built in Italy, and maintained the ultra-cold temperature for more than two weeks. An international team of physicists, including students and postdoctoral scholars from Italy and the US, worked for over two years to assemble the cryostat, iron out the kinks, and demonstrate its record-breaking performance. The claim that no other object of similar size and temperature – either natural or man-made – exists in the universe was detailed in a recent paper by Jonathan Ouellet, Berkeley Lab Nuclear Science staff and UC Berkeley graduate student. In order to achieve such a low-temperature cryostat, the team used a multi chamber design that looks something like Russian nesting dolls: six chambers in total, each becoming progressively smaller and colder. The chambers are evacuated, isolating the insides from the room temperature, like in a thermos. The outer chambers are cooled to the temperature of liquid helium with mechanical coolers called pulse tubes – which do not require expensive cryogenic liquids. The innermost chamber is cooled using a process similar to traditional refrigeration in which a fluid evaporates and takes heat along with it. The only fluid that operates at such cold temperatures, however, is liquid helium. 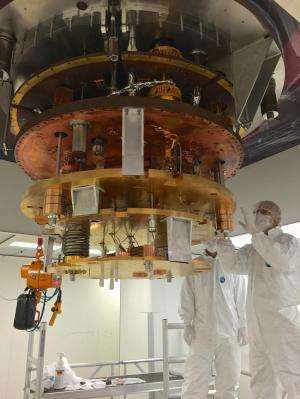 The researchers use a mixture of Helium-3 and Helium-4 that continuously circulates in a specialized cryogenic unit called dilution refrigerator, removing any remnant heat energy from the smallest chamber. The CUORE dilution refrigerator, built by Leiden Cryogenics in Netherlands, is one of the most powerful in the world. "It's a Mack truck of dilution refrigerators," Kolomensky says. The ultimate purpose for the coldest cubic meter in the universe is to house a new ultra-sensitive detector. The goal of CUORE is to observe a hypothesized rare process called neutrinoless double-beta decay. Detection of this process would allow researchers to demonstrate, for the first time, that neutrinos are their own antiparticles, thereby offering a possible explanation for the abundance of matter over anti-matter in our universe —in other words, why the galaxies, stars, and ultimately people exist in the universe at all. To detect neutrinoless double-beta decay, the team is using a detector made of 19 independent towers of tellurium dioxide (TeO2) crystals. Fifty-two crystals, each a little smaller than a Rubik's cube, make up each tower. The team expects that they would be able to see evidence of the rare radioactive process within these cube-shaped crystals because the phenomenon would produce a barely detectable temperature rise, picked up by highly sensitive temperature sensors. Berkeley Lab, with Lawrence Livermore National Lab, has supplied roughly half the crystals for the CUORE project. 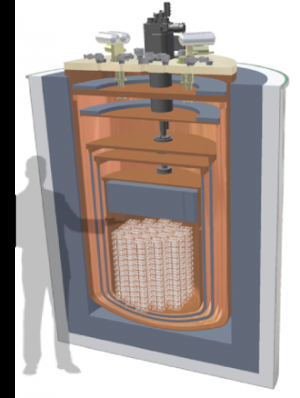 In addition, Berkeley Lab designed and fabricated the highly sensitive temperature sensors – Neutron Transmutation Doped thermistors invented by Eugene Haller, UC Berkeley faculty and senior faculty scientist in the Material Science Division. UC postdocs Tom Banks and Tommy O'Donnell, who also have joint appointments with the Nuclear Science Division at Berkeley Lab, led the international team of physicists, engineers, and technicians to assemble over ten thousand parts into towers in nitrogen-filled glove boxes, including and bonding almost 8000 25-micron gold wires to 100-micron sized pads on the temperature sensors and on copper pads connected to detector wiring. The last of the 19 towers has recently been completed; all towers are now safely stored underground at LNGS, waiting to occupy the record-breaking vessel. The coldest cubic meter in the known universe is not just the feat of engineering; it will become a premier science instrument next year. After looking deeper into this article, it seems as though the copper is actually a container. It is not a solid cubic meter block of copper. The writing of this article however, is rather vague and misleading. Well given the density of copper being apx 8920kg/m^3 at room temperature, then even at 0 degrees Kelvin I can't imagine the density changing that much, except for possibly increasing. The article mentions 400kg of copper in the cubic meter, so yeah, FAR FROM SOLID!!!!! No where in the article does it imply anything about it being a solid mass of copper. The first four paragraphs definitely imply a solid cube, even if it's not explicitly stated. Only the mass stated in para 4 gives the clue that the volume of copper is about 0.045 m^3, as big_hairy_jimbo points out. That would mean (if I've calculated correctly) a hollow copper cube with walls about 8 mm thick. Also note that by looking deeper into this article, I merely browsed through the explore further link which goes to a much more detailed article detailing the experiment, and what it will eventually be used for which was the neutrino detection. It was there that I got the quote I was referencing. You can find that line of text in the second paragraph of the article.